Software Safety .Net, http://www.softwaresafety.net , is a clearing house for items related to Software Safety, particularly in the Embedded Systems and hardware design realms. I've blogged about how the price of our Bills of Materials appears to be going up, previously. A comment on today's, August 7th 2011, Meet The Press by former Federal Reserve chairman Alan Greenspan, promoted me to write this one. Mr. Greenspan stated [Transcripts available here] that "the US will always be able to pay its debts because we can print money" . Echos of a speech given before the National Economists Club in Washington, D.C. on November 21, 2002 by Ben S. Bernanke, the current chairman of the Federal Reserve, who also said we can control or create inflation by printing money. Rick Kahler once said "A slow, chronic inflation is the most politically palatable way of reducing the debt in a manner that is somewhat unnoticeable to the electorate." In otherwords the more moeny in circulation, the more your money is worth less. Prices are not going up, the value of the money is going down! Do these people actually understand how the system works to say these things? If you've listened to any of the 'News' this weekend there has been a big stink that Standard & Poor's downgraded the US's Credit Rating, on August 5th, after the stock markets closed. The Governments rebuttal can be found here. What few places are telling you that is more important, is that Dagong, a key credit information and credit solution service provider in China, Downgrading the Credit Rating of the USA , on Tuesday August 2nd. According to reports on the BBC I was listening to on my daily commute, China has already decided to take their money an invest it in its own people, rather than lend more to the US. What many are worried about is what happens if a Treasury Auction is held, and no one shows up? Then it doesn't mater if there is a Debt Limit or not. Now we need a bit of a history lesson: Andrew Jackson (March 15, 1767 - June 8, 1845) was the seventh President of the United States (1829-1837). Jackson was strongly against the national bank, he vetoed the renewal of its charter and ensured its collapse. This was the last time the US paid off its "National Debt". Alas when Abraham Lincoln (February 12, 1809 - April 15, 1865) was the 16th President of the United States, serving from March 1861 until his assassination in 1865, needed to fund the Civil War, a new bank system was set up. Various incarnations existed, see Paul Warburg's Crusade to Establish a Central Bank in the United States at the Federal Reserve Bank of Minneapolis, until the Federal Reserve Act was passed by Congress at the Christmas recesses of 1913, under suspicious circumstances; there was no "sign and die" to close that session of Congress. "Controversy about the Federal Reserve Act and the establishment of the Federal Reserve System has existed since prior to its passage. Some of the questions raised include: whether Congress has the Constitutional power to delegate its power to coin money or issue paper money, why it was passed on December 23 while most of Congress was away for Christmas, whether the Federal Reserve is a public cartel of private banks (also called a banking cartel) established to protect powerful financial interests, and whether the Federal Reserve's actions increased the severity of the Great Depression in the 1930s (and/or the severity or frequency of other boom-bust economic cycles, such as the Late-2000s recession) ." -- Wikipedia. The Federal Reserve has not been audited, no one to date really knows what happens to the 'money'. Worse almost no one understands how this sham system works. Consider this simplified version: In 1913 the Government declares that all 'money' comes from the Federal Reserve (Fed hereafter). You need to have 'money' to run your business and put food on the table. As the only source of 'money' is the Fed you borrow 'money' from them, which is happy to loan it to you, at interest. The interest rate varies, but they'll get more back, you think. Now what is wrong with this picture? If the only source of 'money' is the Fed, where does the 'money' used to pay the interest come from? It has to be borrowed from the Fed. Remember the Government has declared that the Fed is the only source of 'money', you have no choice, unless you want to barter tangible assets, like real Money, coins, from the US Treasury. The National Debt can never be paid off, because if it was the system falls-apart, as the last 5000 years have shown always happens to this type of system in the end. This schema is really a hidden tax on you and I. It works like this: The Treasury sells bounds, sheets of paper with no intrinsic value, to the Federal Reserve for things that politicians do not have the honesty to come out and say directly that they need to raise our taxes to support. The Fed buys these bonds with 'money' that it created from nothing. This created 'money' is put into circulation, making your money worth less each time it happens. This inflation is the most insidious hidden tax that you and I pay. Few figure this system out because it is usually hidden behind the Orwellian doublespeak of economics such as Quantitative Easing. For a far more detailed look at the history of 'money' and its coming end, check out The Money Masters , the works of Milton Friedman, and the Laffer curve. The current Temporal War on planet Earth. The August 2011 edition of Metrologia. The article are free until the end of August 2011, after which time they go behind a paywall. In this War there are several factions, such as those that believe that Time should be tied to the Earth rotation. 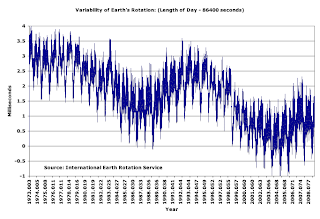 The problem is that the Earth rotation is not constant. To keep our clocks on the wall synchronized the concept of Leap Seconds has to be introduced were a second is added or subtracted every six months from Universal Coordinated Time. From the Embedded System perspective this means an hour can legitimately have 61 seconds in it. Have you accounted for that in your system? An hour could also only have 59 seconds. Maintaining time spans across years becomes a problem, necessitating the use of tables of Leap Seconds. Courtesy of International Earth Rotation and Reference Systems Service. Leap Seconds can currently be tracked at the Time Service Dept., U.S. Naval Observatory. In one of the other major factions they want to do away completely with the concept of Leap Seconds. The clock-on-the-wall-time would slowly drift away from the look-out-the-window-at-the-Sun-Dial-time. This faction believes that it will simplify our lives as programmers. There are also a few lessor factions at play. Based on input from the International Astronomical Union, the Bureau International des Poids et Mesures, the Consultative Committee for Time and Frequency (CCTF), the International Telecommunication Union (ITU), is close (in 2012) to the moment of making a decision on whether or not to decouple UTC from its tight link to the rotation of the Earth. Who is going to win this Temporal War? I do not know, it might come down to the group with the biggest Ray-Gun. One thing is for sure, that in a year or two keeping accurate Time in our Embedded Systems might just get a lot harder. Follow the daily battle and decide which camp you want to put your future with, on the Leap Second List. Philway board house fire. One year later. Even "Design Patterns" still have bugs. A common Queue bug. Are You Licensed Yet? Will Engineering Software Become Illegal Unless You Have a License? Comet to cause EMP Armageddon? Are you prepared for EMP?